The American people are showing businessmen and businesswomen that while they may be able to ignore the voices of protest that are currently resonating across the country over the Donald Trump presidency and all the controversial executive orders that have come with it, they’re not going to be able to ignore this coin. The #DeleteUber movement saw this come to pass after Uber CEO Travis Kalanick swiftly stepped down from a Trump advisory council after realizing how serious people were when more than 200,000 users deleted their Uber accounts. 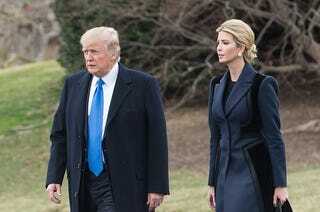 And now Nordstrom and Ivanka Trump are both being reacquainted with the weight of consumer money power after boycott threats and concerns about Ivanka Trump’s conflicts of interest. According to Bloomberg, the department store chain has now decided to stop selling Ivanka Trump’s brand, citing sales. Nordstrom is known for offering thousands of brands, and according to the company, it cuts about 10 percent of them each year based on their performance. “In this case, based on the brand’s performance, we’ve decided not to buy it for this season,” the company said of Ivanka Trump’s products, referring to the spring season. This latest move is a far cry from the company’s stance in November, when it responded to a shopper’s open letter asking it to stop selling the Ivanka Trump brand. However, as the site notes, Nordstrom became a target of the #GrabYourWallet campaign, which asked shoppers to boycott retailers that carry Ivanka Trump or Donald Trump goods. Ivanka Trump had already come under fire for blurring the line between promoting her brand and politics after her company sent out a “style alert” to journalists in November to promote a gold bracelet she wore during a segment on CBS’ 60 Minutes. “I am absolutely thrilled, and I know the vast majority of Grab Your Wallet participants will be as well,” Shannon Coulter, a co-founder of Grab Your Wallet, said, according to the website. As of Friday morning, three pairs of Ivanka Trump shoes remained listed on Nordstrom’s website, all of them having been marked down by 40 percent.